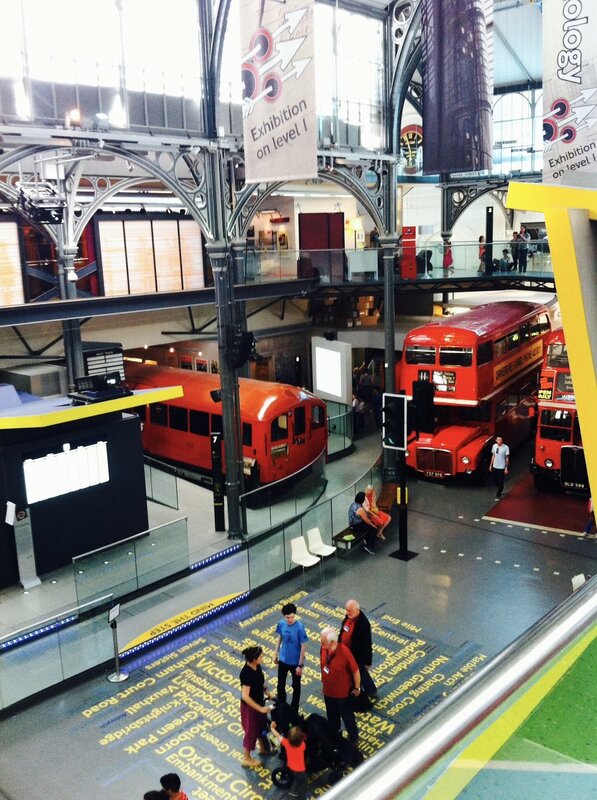 Tucked in a corner of the vibrant Covent Garden square, nestles the London Transport Museum. I have an Underground crazy nine year old, so on our last trip we made a point to devote a couple of hours to visiting this museum, after visiting the Natural History & Science ones previously. 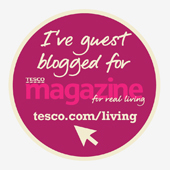 The location is very simple to find, and within minutes walking distance from Covent Garden tube station. It's also only a short walk from Leicester Square, so if you are approaching from the tourist hub of the theatre district, it's actually easier to walk above ground than go hop Underground stations from the Square to Covent Garden. There are also dozens of mini boutiques and cafes you may want to pop into along the way too. Covent Garden has a concentration of glorious little makeup stores of some of the more independent brands that don't show up in Department Stores. There's even a shop dedicated completely to The Moomins. The Transport Museum has a small, modern, glass entrance pavilion, with a free to browse merchandice store and upstairs Cafe. You can then purchase tickets for the Museum on the day, or collect your prepaid online ones. 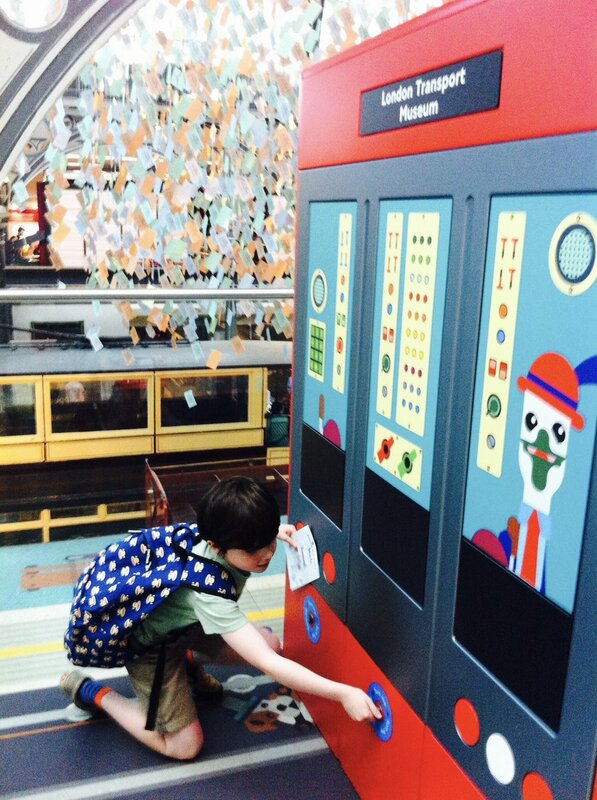 Kids go absolutely free at this museum, adult London Transport Museum tickets are £17.50, but there are group discounts, concessions etc so click through to the website to see if you can take advantage of any of their offers. The museum is on several levels, all accessible by lift, and they layout is very easy to follow around. The displays are engaging and informative, with interactive portions so kids won't even notice they are being educated on the sly. Dotted throughout the whole museum are these card stampers. 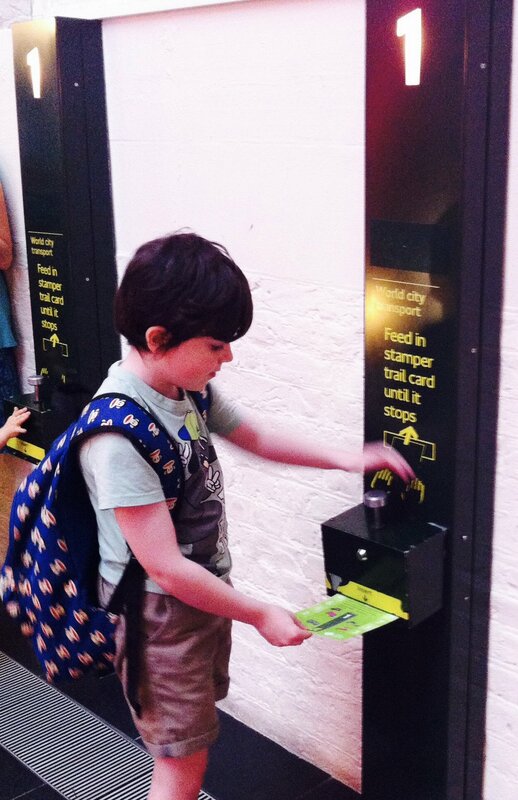 Each child will have their own card with numbers on it, to find and stamp as they pass through the exhibitions. The stamp cutter then chops their card into various different shapes, the same way a train or bus conductor would mark a ticket back in the day. Smix really enjoyed this game and it makes for a cute souvenir for the scrapbook back home. You'll learn the history of public and private transport in London from the early beginnings of the settlement, right through to the present day. The history of steam trains, with life size vintage carriages and even engines you can pop inside and pose for pictures in. There are old London buses, with the history of the service within the city, as well as horse drawn carriages that used to be seen on the streets of 19th Century capital. 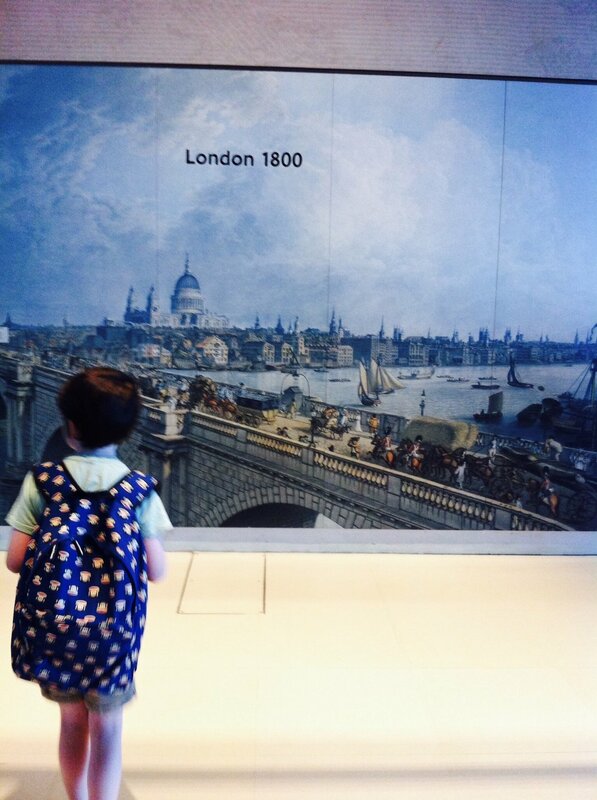 Smix was most interested in the history of The London Underground, which the museum features heavily, so he was delighted. The history of the various lines, how the tunnels were made, the specs of the trains used, there was even a section on driver uniform and the different seat fabrics used for each train line's carriage (shown right). That was my favourite part- a capsule exhibition about the retro advertising campaigns was also a winner for me. If you have young kids with you, even up to Smix's age, will enjoy the special play area on the main exhibition hall floor (see below). They can drive a bus, ferry, train, or even work as the lost property in a mock up Underground Station. The interactive fun area gives Mums & Dads time to have a sit down & a coffee and snack, if you wish to. We were there mid-week, mid-summer & it was busy but by no means chaotic. Lots of tables & room to play. Smix stood for ages just watching this HUGE live map of locations of buses & tube trains over the city, very cool. All in all, over the entire museum's exhibits we must have spent a good two hours there, but if you took time to read more of the displays and all the history you could easily spend twice that time. I would say with the kid entrance being free, if you are just paying for one adult then it's a fair price for a few hours of fun and entertainment in the centre of the city. Even the seating section outside the bathrooms (below) looks super cool, and we could have spent a fortune on Underground merch in the store. 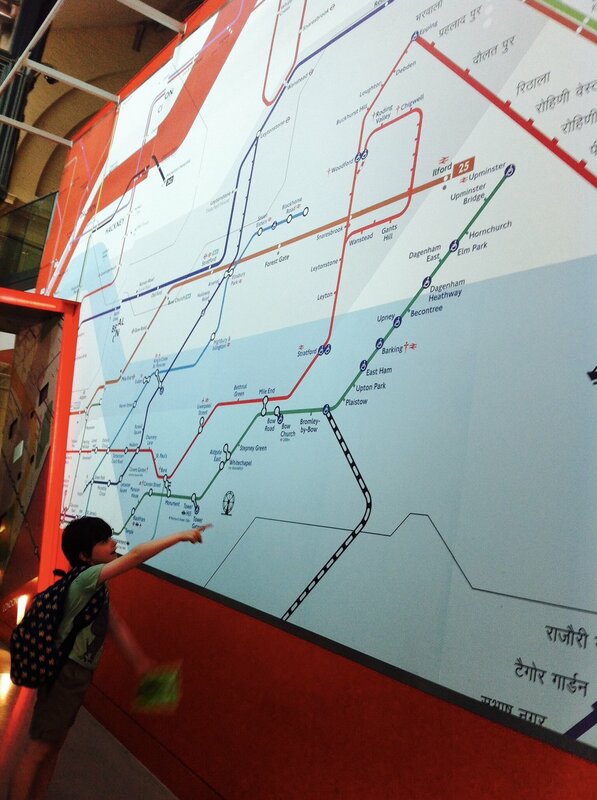 So a big thumbs up from us for the London Transport Museum. 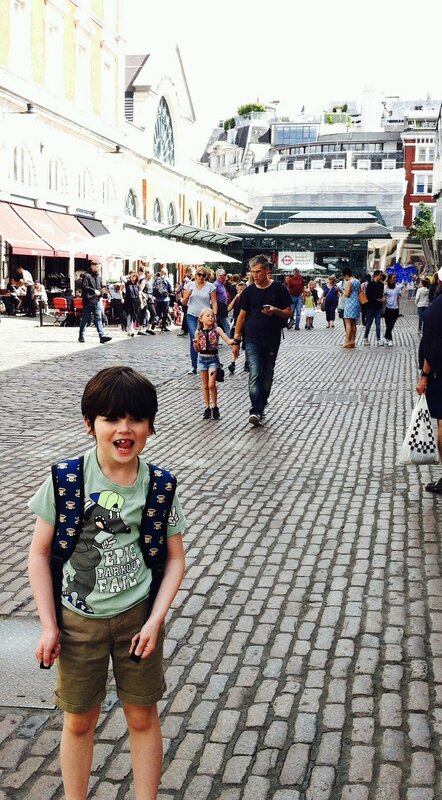 If your kids love trains, buses or The Underground it's a must-visit on your next day in the city. Check out our review of the London Duck Tours for a family friendly London trip too!